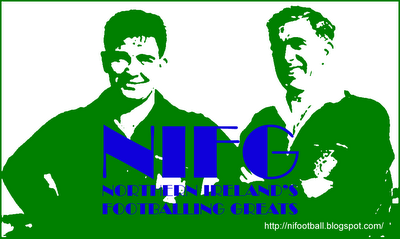 Representative Honours: Ireland: 3 Full Caps/1 Goal (1949-1951); IFA Representative (1953). Son of former international Jack Ferris, Ray was an industrious, strong-tackling red-headed half-back of the immediate post-War period. As a teenager, Ferris had brief trial spells with Irish League clubs Distillery and Glentoran, before seeking his fortune in England. Initially he signed amateur forms with Brentford, but by the outbreak of the Second World War he was playing non-League football with Cambridge Town. War-time guest appearances with Spurs and West Ham drew the attentions of Division Three (North) Crewe Alexandra, and he signed his first professional contract in March 1945, at the age of 24. 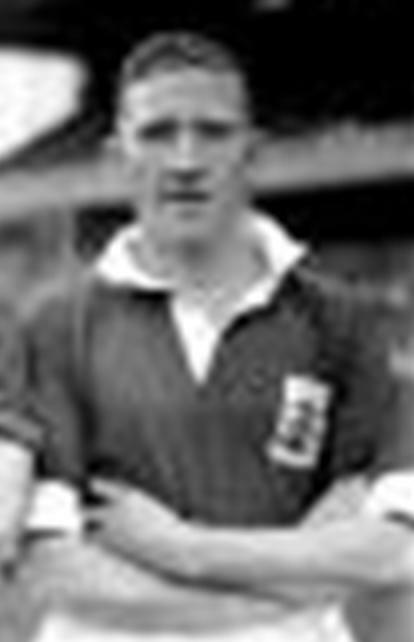 Ferris made over 100 appearances for Alex before his transfer to Birmingham in March 1949. At the time Birmingham were struggling at the wrong end of the First Division, and ultimately finished just above the relegation places. The following season Ferris was awarded his first cap by Ireland, slotting in at left-half for Jim McCabe. On the domestic front Birmingham continued to struggle, and finished in bottom spot at the end of the 1949/50 season. In Division Two Birmingham regained their composure, and although they failed to gain promotion back to the top-flight during Ferris' time at the club, they did continuously challenge towards the top of the table. Ferris also found his way back into the thoughts of the Irish FA's selection committee, taking the field for the glamour 'Festival of Britain' match against France in May 1951. He marked the occasion with a goal from the penalty spot. Ferris toured the USA and Canada with the IFA in the summer of 1953, finding the net in the 5-1 win over Victoria. However, the tour proved to be the end of his top-level career as he suffered a serious leg injury. Released by Birmingham in September 1953, he hung up his boots the following April after a brief spell with Southern League Worcester City. Remembered as a real character of the game, after hitting one of his regular pin-point passes, Ferris would turn to the bench and wave, shouting: "What about that?" He remained in England after his footballing days were over, and died in a Manchester nursing home in 1994. He had had his legs amputated due to circulation problems, a result of his earlier footballing exertions.